I am very happy to welcome R.J. Larson, author of the new Christian fantasy novel, Prophet. Welcome to the blog, R.J.! R. J. Larson is the author of numerous devotionals featured in publications. She lives in Colorado Springs, Colorado, with her husband and their two sons. 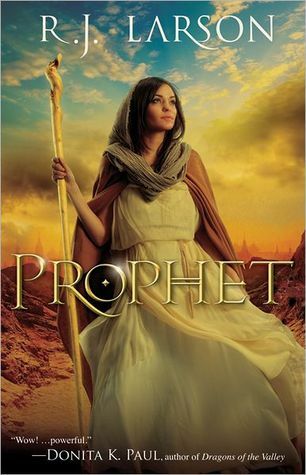 Prophet marks her debut in the fantasy genre. Visit her on her blog or on Twitter. How did you come up with the idea for Prophet? I was so drawn to Ela’s story, and her Creator’s words…they were impossible to ignore. I never expected to write fantasy. My favorite research topics are ancient history, Biblical history, medieval history, and the 1800’s. I was working on an 1890’s novel when Ela’s story hit me, and I did NOT want to abandon my fictional Victorian-era family for some “out-there” fantasy epic. I love fantasy, but to write it? No, not me. I resisted the notion for days. Weeks, actually. Until I realized that my Biblical and early medieval studies played right into building Ela’s world. Moreover, Ela refused to leave me in peace. She was so persistent that I knew I’d be unable to finish my cherished Victorian novel if I didn’t clear Ela’s story from my thoughts. I finally emailed my agent, explained the situation, and begged permission to write fantasy—a genre my agent doesn’t usually handle. Thankfully, my dear agent humored me and agreed to present Ela’s story to publishers. Where did you get the inspiration for the characters? Ela, of course, showed up on her own. The Infinite—her beloved Creator, and ours—was also in the plotline from day one. As I wrote, and consulted the scriptures to research Prophet, the other characters each stepped into place, so real, so vivid, I felt as if I’d been watching a movie. The most difficult part of the whole process was finding time to pour the book from my thoughts into my computer. I work almost full time, so I wrote on my two days off per week. Which character from the book is your favorite? Ela. I loved her strength and dedication to her calling as the Infinite’s prophet. However, Kien and Pet were close seconds! My husband is an editor, and my sister-in-law is an editor and a writer. I’ve been a book fanatic since learning to read at age five, so writing is natural to me. I wrote a few short devotionals for my sister-in-law, Kathi Macias, and gradually built my writing resume. Do you read the same genre as you write? What are you currently reading? I do read fantasy, but I also read many other types of books. My latest read is a cookbook—crockpot recipes! (I depend on my crockpot to cook dinner while I’m writing. I had to buy a new one while I was writing this series.) I’m also reading The Hobbit, and I am eagerly awaiting Donita K. Paul’s next book, Realmwalker!!! Goodreads Summary: Ela Roeh of Parne doesn't understand why her beloved Creator, the Infinite, wants her to become His prophet. She's undignified and bad-tempered, and at age seventeen she's much too young. In addition, no prophet of Parne has ever been a girl. Worst of all, as Parne's elders often warn, if she agrees to become the Infinite's prophet, Ela knows she will die young. DEFINITELY on my TBR list. Thanks for bringing this one to my attention! I think the last time I was excited for a Christian release (I guess I need to keep my ear to that side of the blogosphere somehow) was back when Wolves Among Us by Ginger Garrett was being released this time last year. I need to actually get the book & read it! Did you read it? KM, I absolutely love Christian crossovers as well and plan to review Prophet next week. Jenny, I did read Wolves Among Us! It's good but darker than I expected which was silly of me to expect different because it's a book about witch hunts. My friend read it as well and had no issues with the dark aspects of it so you may like it more than I did. NC, thank you for featuring PROPHET!